Dorothy Day – A saint for the modern world? I have often heard older people say that the younger generation no longer seem to call their children by Saints’ names. There was a time, in Ireland anyway, when girls tended to be christened Mary, Ann or Catherine. Perhaps some of the saints lived too long ago and it may be that we need to identify some more modern saint-like figures, more suitable for the times we are living in. 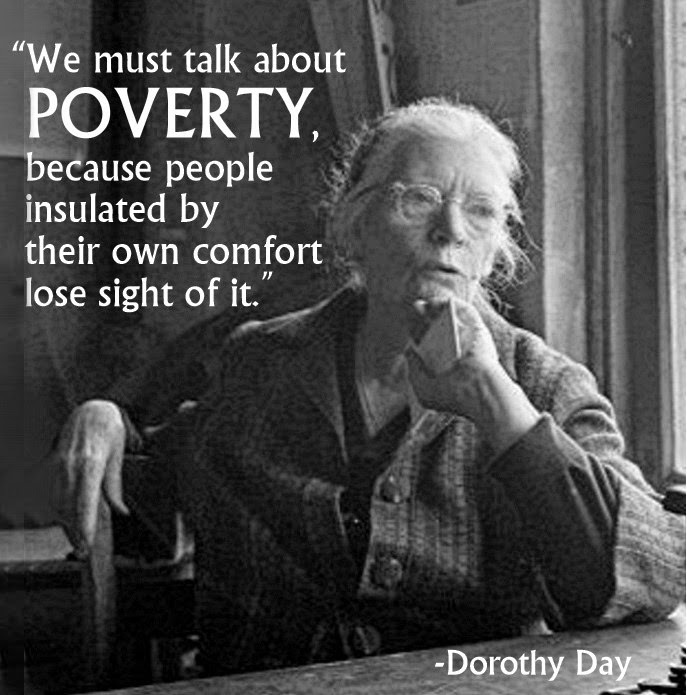 Dorothy Day is one such. Born in Brooklyn, a few blocks from the bridge, on November 8, 1897 she was the third of five children. The family did not attend church. Formal participation in religion only began when an Episcopalian pastor persuaded her parents to send their children to Sunday services. Dorothy came to love the psalms, and years later, she recalled, in her autobiography The Long Loneliness “I had never heard anything as beautiful as the Benedicte and the Te Deum.” In this book she also reveals her lifelong attraction to the radical life among anarchists, socialists and communists. By the age of fifteen she was an avid reader, and began reading works on labour history, novels by Leo Tolstoy and Dostoevsky, the works of Jack London and Upton Sinclair. Reading these books led her to distrust all churches and regard religion as being for the weak. She did, however, continue to believe in God and read the New Testament. When her family moved to New York she dropped out of college and against her father’s wishes found work as a journalist for a succession of radical periodicals. In 1917 she was part of a demonstration for women’s’ rights in Washington DC and was arrested and jailed for the first time. After her release she lived a bohemian style of life in the East Village. She spent her time in bars with journalists, intellectuals, and the playwright Eugene O’ Neill, with whom she developed a close relationship. World War I, the Spanish flu epidemic of 1918, and the guilt she felt that she only wrote about social justice, but did nothing to bring about change, influenced her to enrol as a nurse in 1920 . In the hospital she met and fell in love with Lionel Moise. Their affair resulted in a pregnancy which she terminated and spoke of afterwards as “the great tragedy of her life”. The trauma contributed to her strong opposition to abortion after she converted to Catholicism. Abandoned by Moise and depressed, she twice attempted suicide. Then, in 1925, Dorothy fell in love with Forster Batterham and had an overwhelming experience of God’s love through her love for him. Of their relationship she observed, “It was human love that helped me understand divine love. Human love, at its best, gives a glimpse of the love of God for man. When one is in love, one cannot conceive of not being in love.” It was to be the birth of her daughter that would connect her to the beauty of the divine in a deeply personal way. She wrote, “the final object of this love and gratitude is God.” Simultaneously, she began reading Christian classics and was eventually drawn to the Catholic Church. She had no doubt that her daughter would be raised in the Catholic Church, because it was for the most part, the immigrant church of the labouring class, devoted to the poor, that had appealed to her since her youth. But Batterham had no use for organized religion. He basically told her to choose: either him or her new-found faith. Dorothy chose Catholicism and Batterham left, causing her immense pain. She was given the gift of a rosary beads by a Catholic friend. On her daily walks to pick up her mail she recited the rosary. “No matter how dull the day and how long the walks, the words I had been saying touched me deeply, and filled me with immense joy.” On December 28, 1927, she was baptized into the Catholic Church at the age of thirty. She was very aware that this decision would break the relationship with her radical friends because of their hostile views with regard to the church as institution. In 1932 Dorothy met Peter Maurin A French immigrant who taught her about Catholic radicalism. With his encouragement, she founded a newspaper, the Catholic Worker that combined her talent for writing with her devotion to social justice. The first issue appeared on May 1, 1933, the Feast of St Joseph the Worker. At the same time, Dorothy and Peter opened houses of hospitality for the poor in New York City and elsewhere, providing food and shelter especially for the homeless. Dorothy lived in one of these houses, writing, running the newspaper, welcoming visitors, talking to volunteers. Organizing meetings and praying. Throughout her long life Dorothy attended Mass daily, read the scriptures, prayed part of the Divine office and said the rosary. Pope Benedict XVI spoke about her conversion as an example of how to “journey towards faith…in a secularized environment.” Pope Francis included her in a short list of exemplary Americans, together with Abraham Lincoln, Martin Luther King, Jr., and Thomas Merton, in an address before the United States Congress. The Church has opened the case for Day’s possible canonization, which was accepted by the Holy See for investigation. As a result she has been bestowed by the Church with the title, Servant of God. Many aspects of Dorothy’s life may make her seem like an unlikely candidate for Sainthood. After all this was a woman who lived with a man, had an abortion, drank a great deal, was designated as a communist and an anarchist, was shot at, jailed four times and investigated by the FBI. Ironically, it is these very things which make her struggles and journey towards absolution all the more credible, as well as proving that in this life there is always the possibility of redemption.